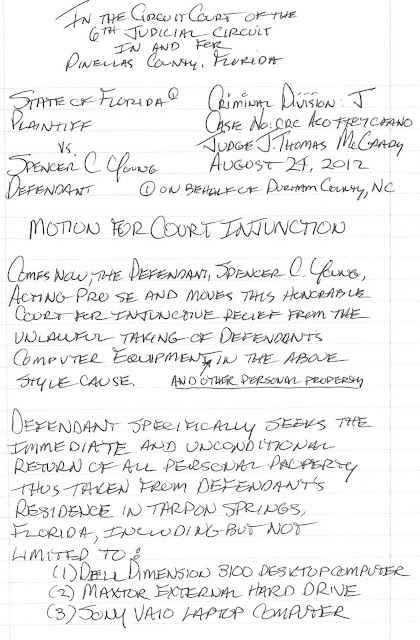 During his UNLAWFUL 127-day incarceration, Spencer C. Young was UNLAWFULLY denied legal representation and access to any computers. Therefore he had to represent himself (referred to as "Pro Se"), and file hand-written motions on his own behalf (see below). Worse yet, he was denied access to a copier, so he had to painstakingly hand-write additional copies for the Court Clerk, and for himself. This was just another inhumane form of torture by criminal public officials. 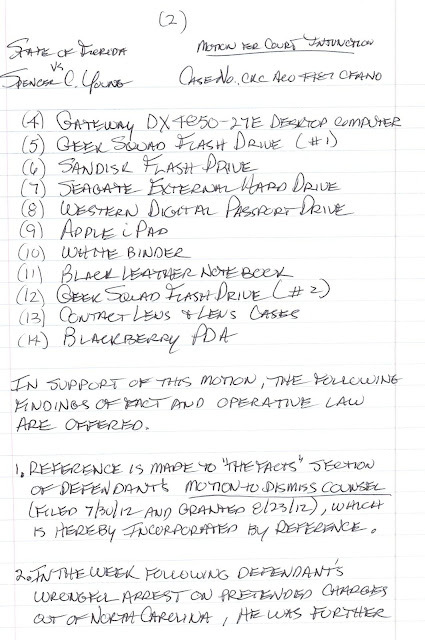 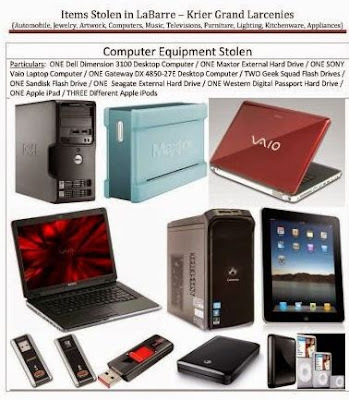 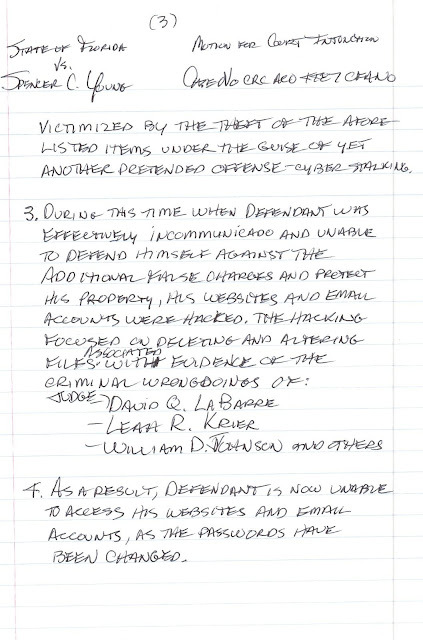 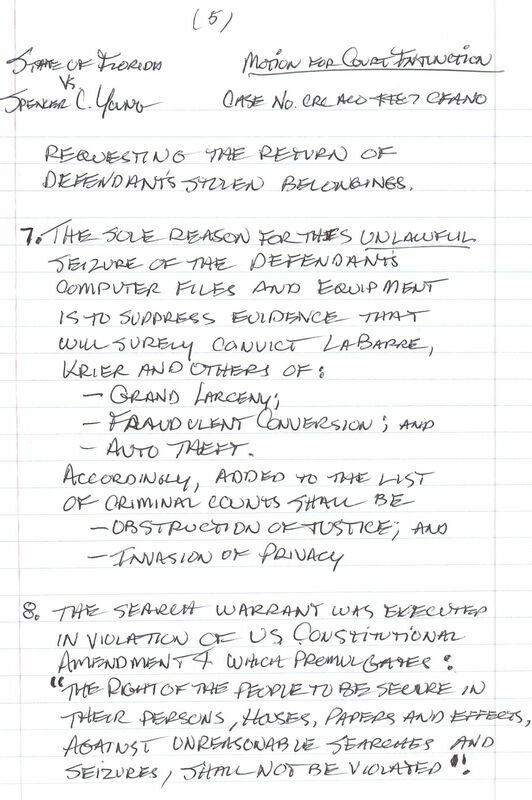 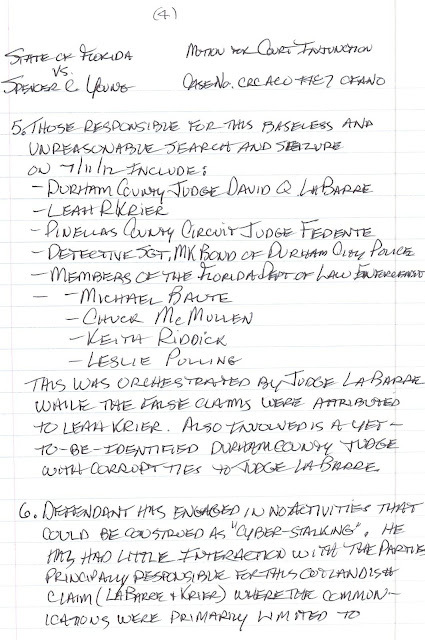 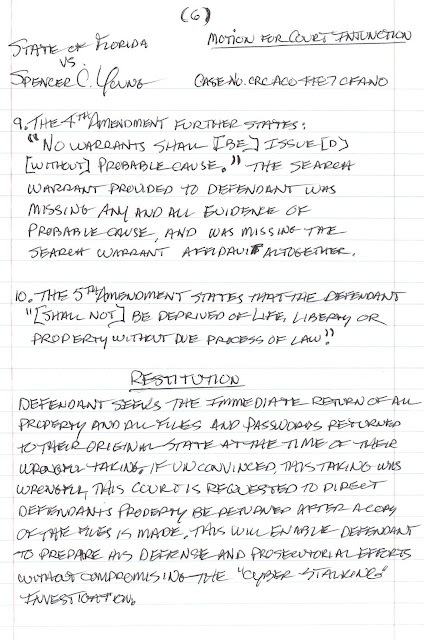 Reflected below is Mr. Young's Motion For Court Injunction which sought immediate injunctive relief for the wrongful taking of his computer equipment (pictured below) in what was clearly an UNLAWFUL search and seizure, and authorized by a woefully corrupt Pinellas County (FL) Judge, Philip J. Federico, who maliciously disregarded the Fourth Amendment to the US Constitution. 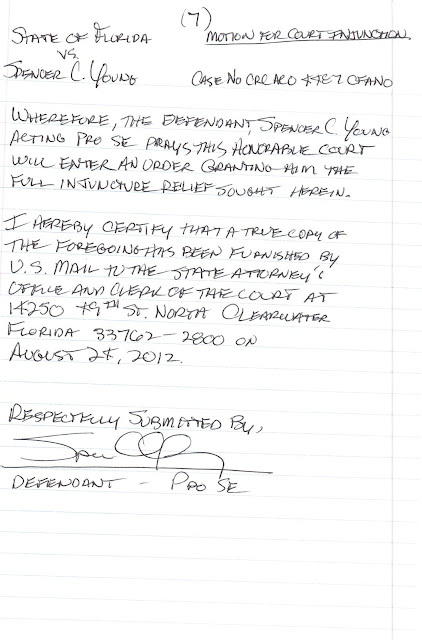 The judge principally responsible for perpetuating Mr. Young's UNLAWFUL incarceration in Pinellas County (FL) jail was J. Thomas McGrady, who was at the time Chief Judge of the Sixth Judicial Circuit (for Pinellas and Pasco Counties in Florida). 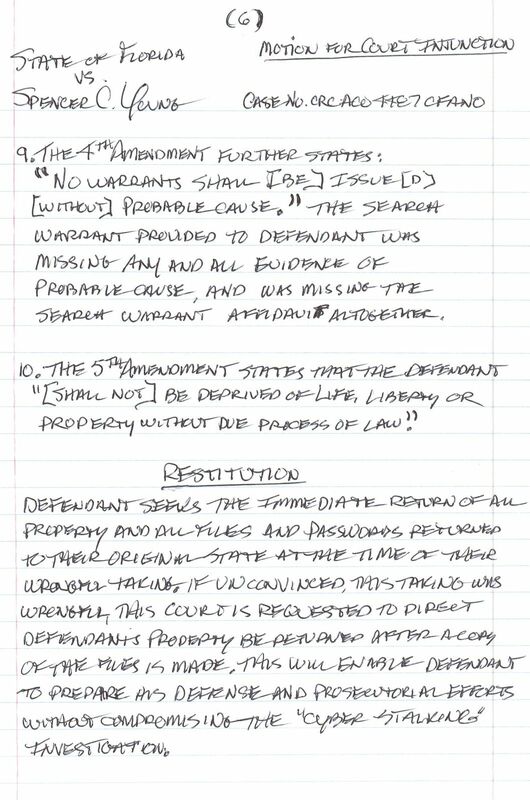 Mr. McGrady chose to not seek reelection as Chief Judge because Federal CRIMINAL "Color of Law" Charges were filed against him for his reprehensible disregard for Mr. Young's rights. 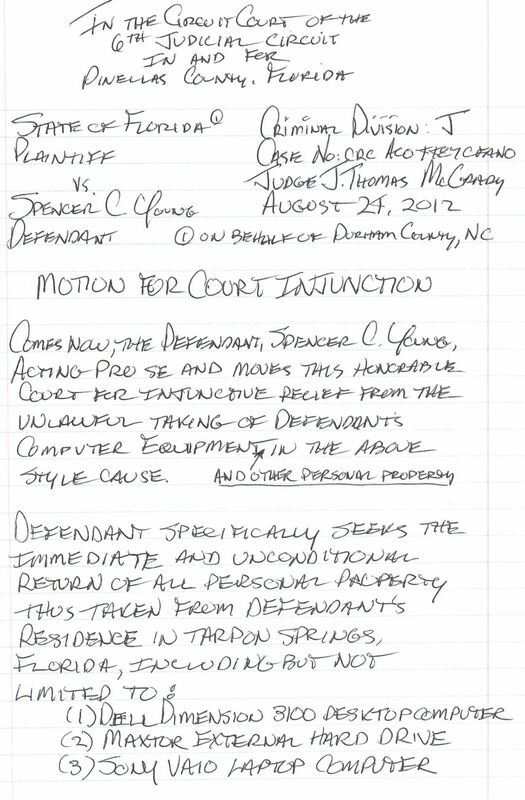 The profoundly corrupt McGrady responded to this motion in the same manner as he had done with all other motions -- he simply rejected it in direct violation of Mr. Young's Constitutional rights.